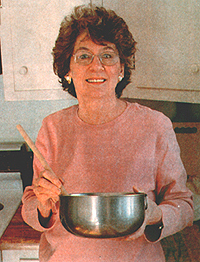 Joyce Sproul started entering recipe contests more than 20 years ago. The first time she entered a recipe contest, Joyce won a designer scarf for her recipe in a La Choy contest. Joyce used their bean sprouts in a spice cake recipe, which, she says, tasted very much like a carrot cake. That, as they say, is history. Over the next two decades of contesting, Joyce has won prizes from Quaker Oats, Tropicana, Kraft, Woman’s Day, Family Circle, Hotel Sofitel, Florida Beef, Kretschmer, Campbell Soups, Swift-Eckrich, Weight Watcher’s, Dunewood Wines and Progresso Soups… among others. NOTABLE WINS: Finalist, Pillsbury Bake-Off, 1984 and 2002; Finalist, in three Delmarva Chicken Cook-Offs; “Best Under 300 Calories,” National Beef Cook-Off, 1988; “Best Microwave Category,” National Beef Cook-Off, 1991; Finalist, National Beef Cook-off, 1993; Finalist, National Chicken Cooking Contest, 1991, 1995 and 1999; Grand Prize, Florida Egg Cook-Off, 1987; Grand Prize, “Pace Pick Up The Pace” Recipe Contest, 1988; Grand Prize, Rice-A-Roni, 1999; Grand Prize, Blue Bonnet “Bake it Better” Contest (cookie category), 2001. BEST SURPRISE WIN: “Just before the deadline in a sandwich contest, I hurriedly sent in a recipe without testing it,” Joyce said. “I didn’t have much hope of winning but several weeks later I was surprised to receive a letter informing me that I had won the Grand Prize consisting of a range, a dishwasher,a refrigerator, a microwave, and a washer and dryer.